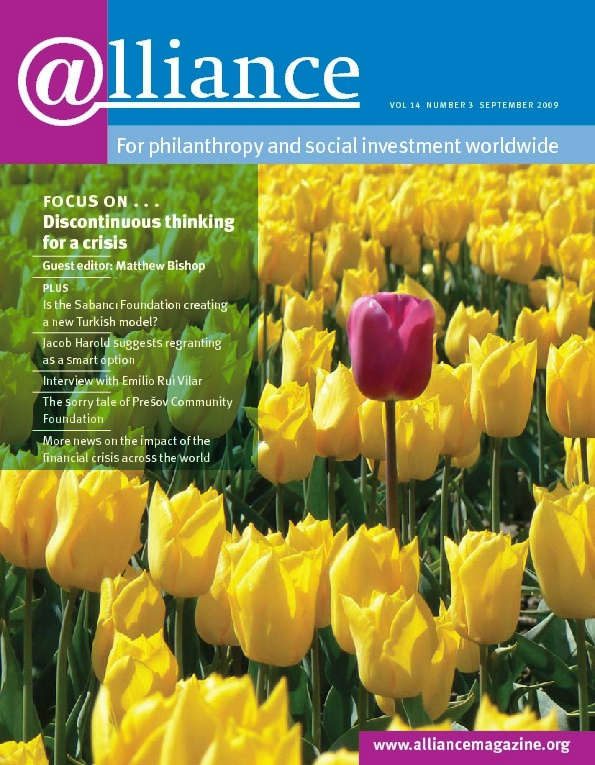 I appreciate Aaron Dorfman’s kind words about the impact of the Center for Effective Philanthropy (CEP) and the quality of our conference in his review in the June issue of Alliance. I welcome both his encouragement of social justice funders to see the relevance of our work and his challenge to CEP to reach out more effectively to those funders. The good news is that, contrary to what he suggests, both parties are off to an excellent start. Social justice funders have adopted CEP’s assessment tools at a high rate since we first launched the Grantee Perception Report(r) (GPR) in 2003 – higher than the overall population of the largest 500 US-based foundations. Eleven of the top 20 US-based social justice funders, as defined by NCRP in its Criteria for Philanthropy at Its Best, have used CEP’s assessment tools. Those funders – Marguerite Casey, Northwest Area, Noyes, Fannie Mae, Heron, Gill, Ford, Haas Jr, Rockefeller, California Endowment, and Commonwealth – recognize the importance of getting the candid, comparative feedback that CEP’s tools provide. They understand that they can achieve their goals only in partnership with their grantees and other key stakeholders. Furthermore, we have consistently featured social justice funders in our research, at our conferences, and on our website. For example, the Gill Foundation was profiled in Beyond the Rhetoric: Foundation Strategy and featured at our conference that year. We value the contribution of social justice funders and the perspectives they bring to our work. Of the six members of our Board of Directors who currently work at foundations, two – including our current chair – work at funders that can be found on NCRP’s list of 56 top social justice funders. There is simply nothing to suggest that CEP has a particular challenge reaching these funders, nor to support the contention that they were under-represented at our conference. The fact is, many of the 112 foundations that sent staff or board members would not have been eligible to appear on the NCRP list: because they are based outside the US, because they have been established too recently, or because they are too small. We are pleased that a significant number of leading social justice funders joined us in Los Angeles, especially given the curtailed travel and conference budgets at many foundations. Of course we can do better, and I imagine that Aaron is not alone in the way he perceives CEP. I welcome suggestions for how we can more effectively communicate the value of our work – or respond to concerns social justice funders may have.